Tulum boasts about ideal conditions not just for those who want to chill out on the beach and just finally switch off for a while. You may want to enjoy local bars and restaurants with delicious food and just be easy and savor the open-air lounge. Or you might want to be a little bit more curious, adventurous and throw yourself into something completely new and thrilling. Why not some paddles, boards and kites? In a way combining snowboarding, windsurfing, paragliding and gymnastics, kiteboarding is a sport using power of the wind with a large controllable power kite to be propelled across the water on a kiteboard similar to a wakeboard a small surfboard with or without footstraps or bindings. Kiteboarding schools in Tulum offer one-day or longer courses to anybody who likes to see the sea from a different perspective. 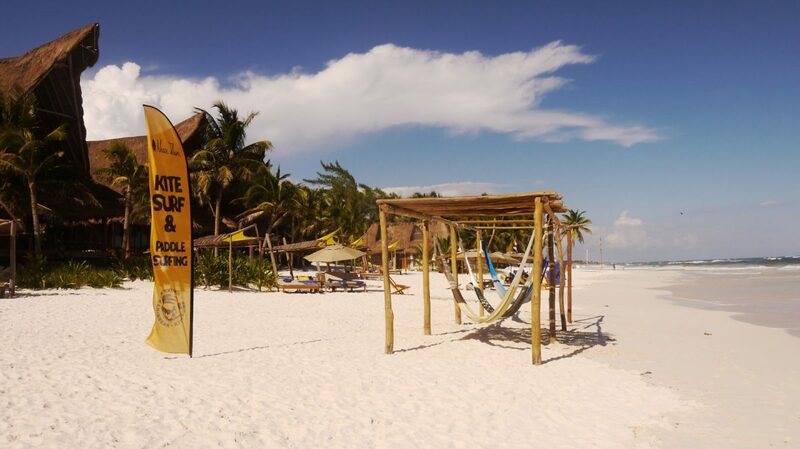 You can hire all equipment directly in one of the Tulum’s kiteboarding schools for good prices. The European pioneers of kiteboarding are the Legaignoux brothers from Breton, France, who invented the first inflatable kite. They demonstrated a kite prototype and filed their first patent. At the same time in Oregon, USA, Cory Roeseler was developing his Kiteski together with his dad, Bill Roeseler, a Boeing aerodynamicist. Cory’s KiteSki could go upwind and had a water re-launch system. In the late 1990s, the Kiteski evolved into a single board similar to a surfboard. In 1997 the Legaignoux brothers started to produce small numbers of kites, which they then sold under the brand name Wipika. The birth of kiteboarding as a mainstream sport really began in 1998 when the first kiteboarding event was organized on Maui in Hawaii. Get Me to Tulum Now! Tulum is very easily accessible from the international Cancún Airport from which you could be transferred in 1h 30 minutes. One of possible means of transfer is shuttle to Tulum provided by www.tukankin.com offering not just private and VIP services but also economic shared shuttles’. Transfers to Tulum are fast and very comfortable.